After you sign into Haiku Deck Classroom, you have two choices for setting up your Course- You may manually create your Course(s) or, if your school uses Google Classroom, you may import directly using that platform. This article explains both options. Each Course is a group of students that you will invite into the app. Some teachers, like the typical elementary school teacher, may have only one Course. Other educators may have several courses. For example, "Period 1, American History" and "Period 2, Political Theory," etc. After you set up your Courses you will be able to invite students to one or more Courses that you create. Sign into your account on www.haikudeck.com and click your name in the top right. Then click MY CLASSROOM from the drop-down menu. When the page loads, click 'Add new Course.' 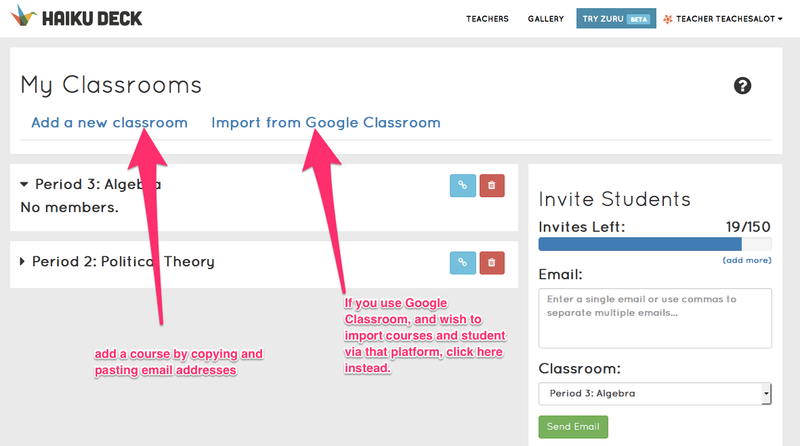 If you are a Google Classroom user, you may import courses and students by clicking on the 'Import from Google Classroom' link instead. This will prompt you to sign into your Google Classroom account and request permissions to share information with Haiku Deck.